What You'll Need: scriptures, bag, apple, vegetable, flower pots for each family member, seed packets, soil and a watering can. Scripture: Abraham 5:9 - And out of the ground made the Gods to grow every tree that is pleasant to the sight and good for food. (Attention Activity) Pass around a bag with a fruit, a vegetable, or branch in it, closed so the children cannot see what is inside. Have the children feel the bag and guess what is in it. Tell them not to guess out loud until everyone has had a chance to feel the bag. When everyone has felt the bag, let the children tell you what they think is in the bag. Take the item out of the bag, and talk about its appearance and usefulness. Everything on the earth was created according to Heavenly Father’s plan. On the third day of creation, Jesus created trees, plants, and flowers (see Genesis 1:11–13). Heavenly Father and Jesus wanted to make the earth beautiful with trees, plants, and flowers. Not only are plants beautiful, but they are also very useful. Trees do many things for us. First the birds use the tree for their home. They carefully build a nest, and the mother bird lays eggs in it. When the baby birds hatch from the eggs, the tree provides a good home for them. It protects them from the hot sun, from the rain, and from animals on the ground that would harm them. The tree also provides fruit for the family that lives nearby. The children play in the shade of the tree and attach a swing to a large branch. When part of the tree dies, the family cuts it down and uses it for firewood to keep the house warm. 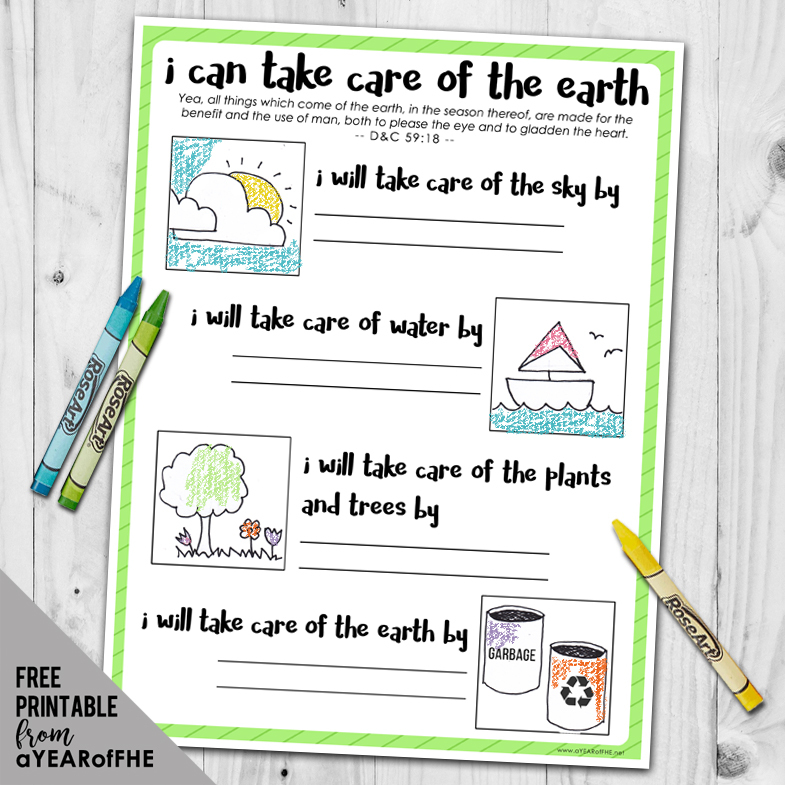 Heavenly Father wants us to take care of our earth because He made it just for us. He made it beautiful and useful. We can show Heavenly Father we are thankful for the earth by taking care of it, planting seeds and trees, never littering, leaving other's plants in their place and watering plants. Bear your testimony about how beautiful the earth is and how grateful you are for plants, flowers, trees, fruits and vegetables. - Get a small pot for each family member and fill with soil. - Let each child decorate their pot with permanent markers. 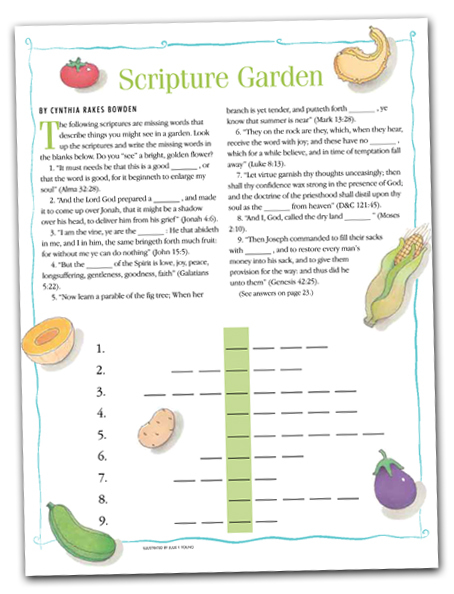 - Help each child plant seeds and teach them about moderate watering and being gentle. Tip: Our family did this last year and purchased a variety of seed packets. By far the most quickly sprouting and hearty plant was the herb Basil. It sprouted within a week. However, our kids planted flowers and they came up within two weeks and flowered. If your kids are impatient...go with the basil. My daughters also loved cooking with Daddy's basil later in the Summer. Thank you for another great FHE, we really enjoyed this and lucky for us the weather was perfect so we spent a lot of the evening outside. I really appreciate these lessons and my kids now look forward to FHE. Excited to do this tonight! We have a little tot at home who loves flowers and plants. While she might not understand what we're saying about the creation, she'll love being outside. Thanks so much for your hard work putting this together!